The assassination of two Colombian journalists in less than one month has again alarmed the country’s press, which has not forgotten the darker years when – due to drug trafficking and other criminal groups – the number of journalists killed because of their work was high. Édgar Quintero. Photo from Fecolper. The most recent case was that of Radio Luna journalist Edgar Quintero, who suffered at least six gun shot wounds from an unknown assailant March 2 in the city of Palmira, in the department of Valle del Cauca – located in southwest Colombia.​The attack took place when Quintero was in a bakery near the radio station where he had worked for over 20 years. In the wake of the murder, police have offered a reward of 50 million Colombian pesos (about US $20,000) and created a special team to investigate the motives behind the homicide. 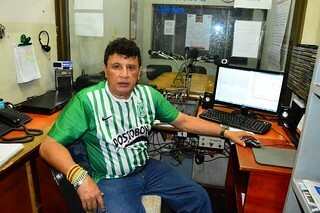 A few days before this murder, journalist Luis Carlos Peralta Cuellar, director and owner of the radio station Linda Stereo – a station linked to Colombian giant Caracol Radio – died after suffering at least six gun shot wounds. The incident took place February 14 in the city of Doncello, a department of Caquetá – located in the northeast of the Amazon – outside his home, which served as his station’s office. Peralta’s wife was also injured in the attack. The director’s colleagues noted that Peralta had mentioned receiving threats, but they did not know where the threats had come from and did not know whether Peralta had notified the authorities. According to the FLIP, the organization documented the police deactiving explosives outside Peralta’s station in 2010. Authorities continue to investigate whether his murder was linked to his mayoral candidacy, which the journalist announced just a few days before his assassination, or to allegations of local corruption he made on his station. For this crime, local police also offered a reward of 50 million Colombian pesos and on March 3, authorities reported the capture of Peralta’s alleged killer. The deaths of Quintero and Peralta join those of hundreds of journalists killed in Colombia in recent years. According to figures published by FLIP in early 2015, it is estimated that 142 Colombian journalists have been killed since 1977, of which 67 cases have expired. “The authorities must act immediately to guarantee the security of all Colombian journalists and to ensure that these cases do not become the latest examples of Colombia’s lamentable record of impunity,” said Carlos Lauria, CPJ’s senior program coordinator for the Americas. *Héctor Pérez, a student in the class "Journalism and Press Freedom in Latin America" at the University of Texas at Austin, contributed to this article.